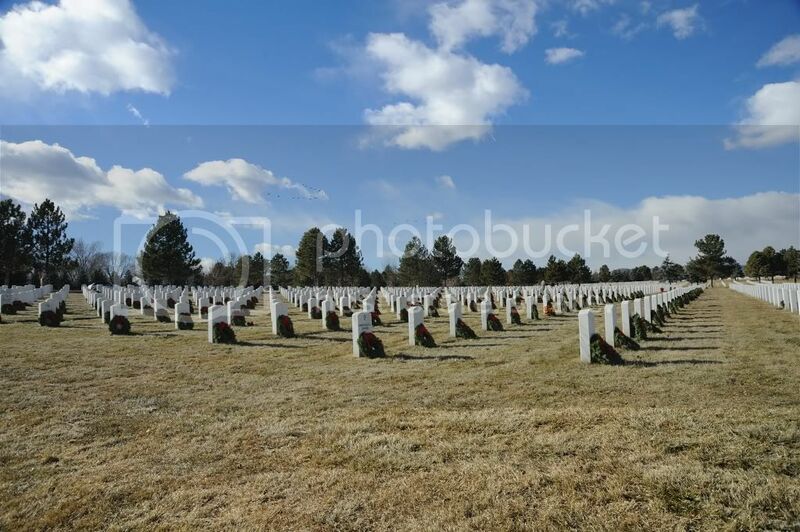 Please follow the link, watch the video and join me in Remembering the Fallen and Honoring those who serve as well as Teaching our children the value of Freedom! my heart is filled with pride for our servicemen and women, past and present, please lets get that message out today loud and clear. 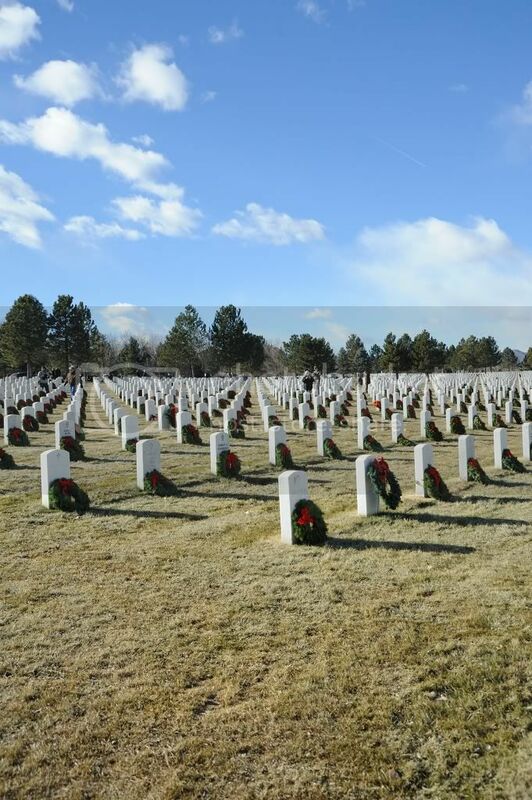 I have added to my calendar to go to the Fort Logan cemetery near Denver they day they place the wreathes and take some pictures. This will remind me to try now to find the dates this year. I missed it last year. By the way, the first of these were privately funded. I remember the day they showed up at Arlington - it was on the national news. Now donations help. There is still time to make a donation. 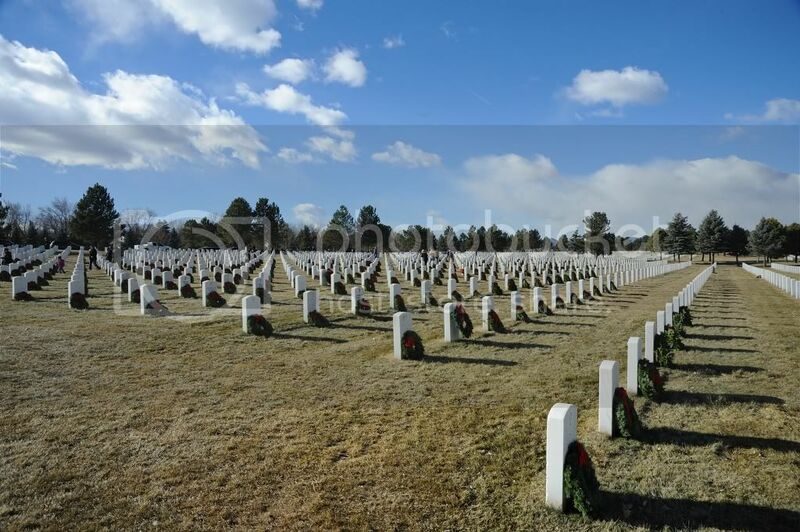 I directed some be sent some to Ft. Logan in Denver and one of the smaller Veterans Cemeteries in Colorado. This year's events will be on 11-Dec. I am planning on going to Ft. Logan and take pictures. Just a bump for this very worthy cause........please consider supporting this Patriotic endevour! And Happy Holidays to you all~! 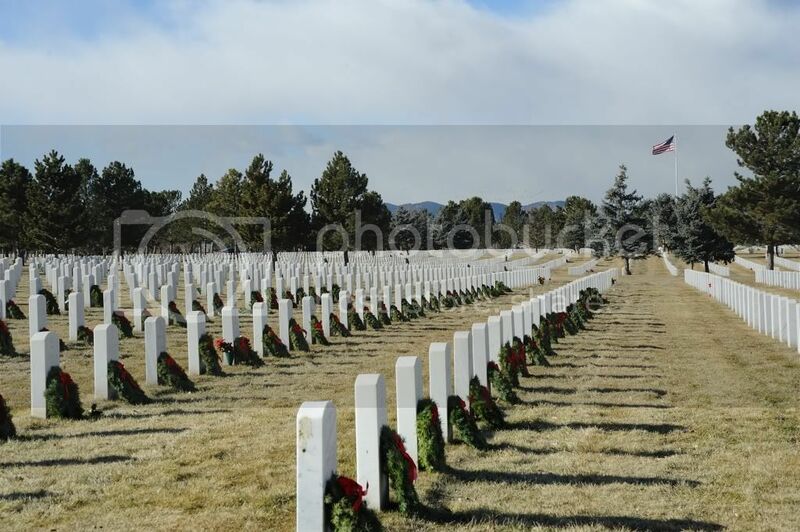 I'm going down to the Ft. Logan cemetery for a photo shoot of the ceremony this morning. I did go this morning. The web site said that the ceremony would be at 11:00, so I got there a little after 10:00. Well, they were wrong. The ceremony was at 12:00noon EST, and synchronized, so they all happened at the same time. That meant ours was at 10:00, so I missed it. 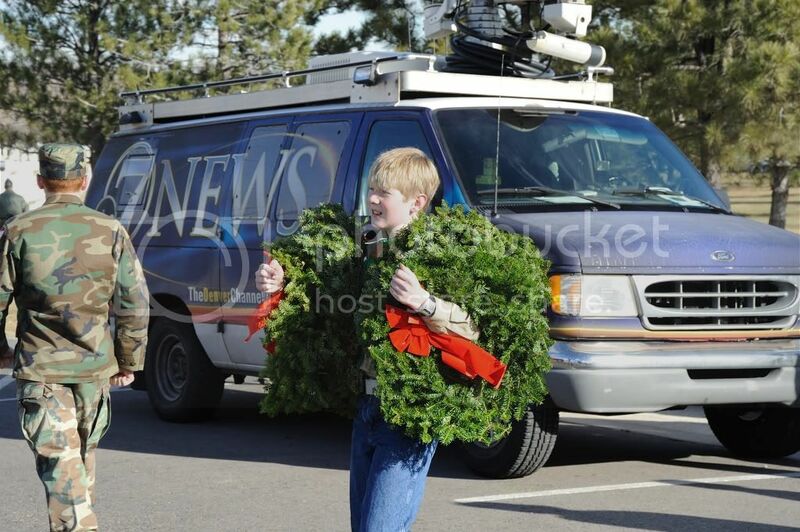 By the time I got there the ceremony was over and most of the wreaths had been placed. 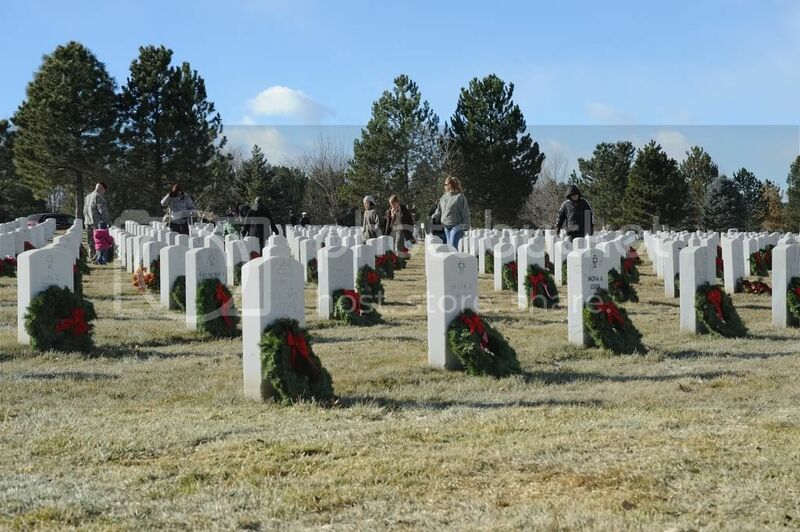 I would estimate around 500 - 1000 wreaths were placed. 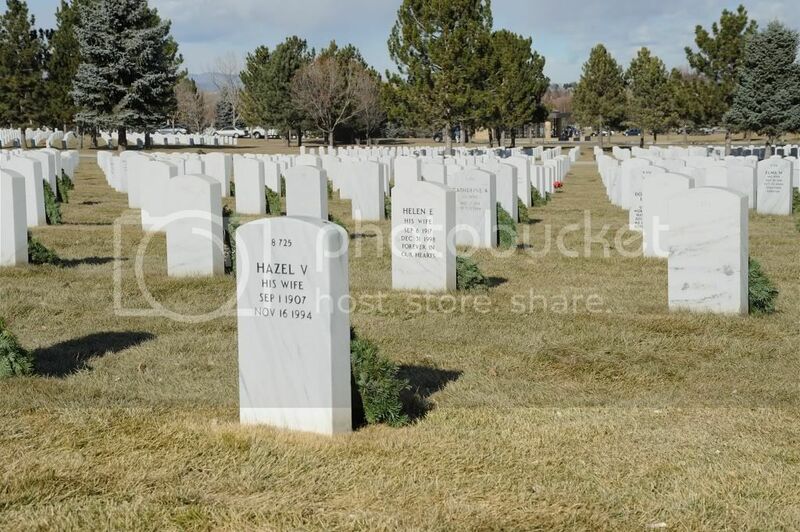 Ft. Logan is a pretty big cemetery so it would have been impossible to do all of them. They did a region around where the ceremony was and seemed to fan out from there. It was a beautiful typical Colorado winter day - blue sky with puffy clouds - but no snow. 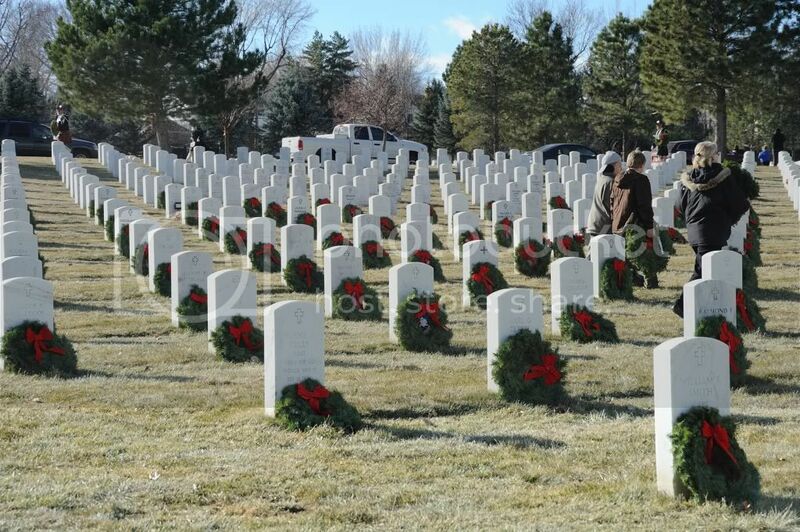 It just felt like there should be snow on the ground to accentuate the wreaths. I'm putting a reminder in my calendar now and will try again next year. 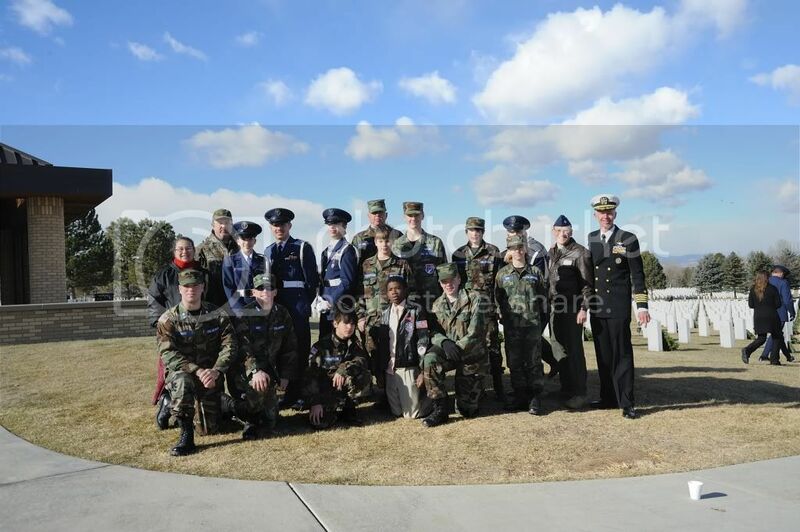 In Colorado the Civil Air Patrol is the organizer. There were lots of young people - in their early teens and older - everywhere. It was so refreshing to see them there. There were many families there too. This is a group photo that was set up just as I was leaving. The fellow at the end - the officer who seemed to be organizing everything - asked if I'd like to get a shot so they all got back again. I'm not very familiar with ranks and dress uniforms, but I believe it to be an Air Force uniform, and doesn't the star on his sleeve make him a general? I have been notified that the photobucket account that is used for the photos above is falling victim to the Photobucket tax. It is likely they will disappear but I don't know when. They will not be hosted elsewhere. Interests:CARS. I have owned well over 225 Cars since 1979 with most being Mustangs. Thanks for Posting. 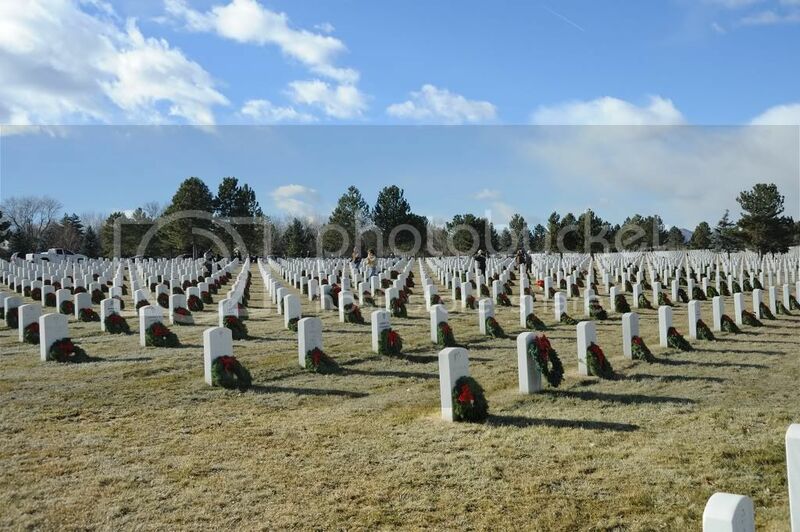 We now have a National Cemetery here in Tallahassee.................I will do what I can to help them. I know this is an old thread but it doesn't look like you ever got an answer to your question. The person on the far right is a Navy Captain (equivalent to other services Colonel). All Navy officers have a star on the sleeve.